"The Head of Your Word is the Truth"
It is true that one can point out the Master Peter Deunov's external life, considering dates and major events in the life of an individuality in the hope of throwing light upon either his works or his character. Doing this, however, one somehow eludes the individuality itself, which cannot be fully contained in the facts of the outer life. Where then, is the Master to be sought? He can be discovered in his lectures, for there indeed are found the internal revelations of the life of a pure, exalted Spirit, who wholly dedicated himself to serve God and to teach and work among people, for their enlightenment and upliftment, preparing them to receive in the future the grace of the Holy Spirit and the perfect Light of the Truth. In the lectures, of which there are over 4000 extant, the Master bestowed upon humanity the True philosophy - the original Teaching of Jesus Christ given 2000 years ago. It is a philosophy unlike any other, for it has applications to life; and the results of this application are these: that one lives and abides in God. This is not something that can be spoken of, but lived and experienced. It is for this reason, when "words are mere stammerings, considering the subject matter", that Christophorus (the author and translator of this web-site) points to the Master's lectures - that one may from one's own experience perceive the Love, Wisdom and Truth of the Teaching of the Master Peter Deunov, thereby perceiving him, too. The fundamental aim of this web page is to present in English translation the pure, unmodified Word of the Master Peter Deunov (Beinsa Douno). It may be known to some, and not to others, that many of the lectures of the Master exist in modified/edited form. Indeed, editing procedures were applied even during the Master's lifetime - without his consent - and they consisted in modifying the Words of the Master, in removing diagrams, in changing whole sentences and other such alterations - to the detriment of the Word itself. Unfortunately, this has meant that many of the Master's lectures in the original Bulgarian are available only in modified form, even before translation. And then, of those lectures currently available in English, many are edited and modified yet again! Given that the Master's Word is not mere literature, the effects of this are disastrous. "However, no human judgment is competent to decide this, for no-one fully knows the things of a man save the spirit of man which is in him, and the Judge of consciences, who alone knows the secrets of the heart." The action of editing, however, is disapproved by Christophorus. So it is that many people are unaware of this editing, and they unbeguilingly read these modified lectures, which are most easily accessible through the internet, believing them to be authentic and to be pure. This web site aims to change this. In the last decade of the last century, effort was made by a certain group of people in Bulgaria to recover the authenticity of the Master's Word by collecting and publishing from what remains of the unedited records containing the Master's lectures. The lectures to be offered on this site are translated only from this corpus of authentic and unedited sources - published in the Bulgarian publishing house "Janua-98" and the volumes "Izgrevat" (by Dr. Vergilii Kreustev). The translations, furthermore, aspire to be scholarly, painstakingly accurate both in meaning and in words, and completely true to the Word of the Master. The author and translator is named Christophorus. In the ancient times, Christophorus was taken to mean someone who has achieved a certain level of initiation into the mysteries of the Cosmos, who, in a sense, bears Christ within himself and thus reflects Him, as the Moon reflects the Sun. The Word of the Master Peter Deunov is Light - the living Word of Christ. Christophorus is thus someone who reflects the Light in its pure form, who bears witness to the true Light, so "that all may believe through him" (Jn 1:7). He himself is "not the light, but came to bear witness to the light" (Jn 1:8). As a secondary aim, the web page wishes to enrich the reader with the manifestations of the Word - with Art, Poetry, Philosophy, Theology - so that the reader may leave this site a richer, better person, having filled themselves with both the true, pure Word as it is found in the Teaching of the Master Peter Deunov, as well as its various manifestations. In this way, the site itself becomes a living application of the Teaching of the Master Peter Deunov (Beinsa Douno). The table of contents is further below - please scroll down to see it. 18 Aug 2013: Two new e-books have been released as part of the Authentic Texts in Translation series. You can read more about these e-books on the lectures page (in the new e-books section). 31 Dec 2012: A new page has been added, which addresses various important topics such as what to do to study the teaching of the Master Peter Deunov (Beinsa Douno); on the original Word of the Master; the last prophecy; relations with Albert Einstein; the Master Peter Deunov (Beinsa Douno)'s spiritual identity; and others. - He is revealed through His Word. and yet are present everywhere. with everlasting joy to have and serve You. the ear but fascinating to the affection. ardor of the love it excites." The Master Peter Deunov (Beinsa Douno)'s teaching was for the most part imparted verbally in lectures - sometimes also referred to as sermons - and recorded stenographically (i.e. word for word, according to the skill of the stenographers). The lectures were divided into a number of classes: Sunday Lectures, for the general public; Morning Talks, generally given before 6am, "for mystical souls"; General and Special/Youth Esoteric Classes, as well as special lectures given during various travels and gatherings. The lectures translated here are taken from these different classes, with emphasis on the Sunday Lectures, especially from the series "Strength and Life" volumes/books 1 to 3, which are the best preserved and most faithful to what the Master spoke. The translations will also be made available as freely downloadable e-books. Throughout his life the Master Peter Deunov (Beinsa Douno) gave his followers and students numerous prayers for a variety of occasions and purposes: for healing (The Healing Prayer), after fasting (Praise), for departed souls, for children, as well as for general devotion and spiritual elevation (The Good Prayer, Prayer of the Kingdom etc.). This page contains (original) translations of a comprehensive collection of these prayers, as well as a small group of so-called "formulas", which can be described as focused, concentrated thoughts. During the period of (approx.) 1900 to 1914, the Master Peter Deunov (Beinsa Douno) corresponded frequently with his early students and followers, leaving a sizeable oeuvre of letters. This page includes a small selection of these. Over time the Master Peter Deunov (Beinsa Douno) drew many followers and students from all over Bulgaria. Thanks to the work of Dr. Vergilii Kreustev during the 1970s, 80s and 90s, many of those followers and contemporaries who were still alive at the time were able to leave behind memoirs and stories of their life at the "Izgrev" - the community organized by the Master's followers - filling over 20 thick volumes in Bulgarian. These stories and memoirs, while predominantly anecdotal in their historical accuracy, offer a glimpse of life around the Master through the eyes of various people, and contain many points for reflection, whether amusing or serious. In comparison to the 20 thick volumes, this page presents in translation an extremely modest selection of the shorter memoirs, predominantly those of Boris Nikolov (a close follower of the Master). This page addresses various important topics, such as what to do to study the teaching of the Master Peter Deunov (Beinsa Douno), on the original Word of the Master, the last prophecy, relations with Albert Einstein, the Master Peter Deunov (Beinsa Douno)'s spiritual identity and others. This page answers a number of questions about this web site in artistic form. It treats problems of translation, authenticity and fidelity in records of the Word of the Master Peter Deunov (Beinsa Douno), and other interesting issues. For those who can read Bulgarian, ``Library "Triangle"'' (previously ``Library "Beinsa Douno"'' (see Acknowledgments below)) provides hundreds of lectures online from the Master Peter Deunov (Beinsa Douno) in Bulgarian - the boldface links are from the authentic sources of the publishing house Janua-98. Paneurhythmy is a method given by the Master Peter Deunov (Beinsa Douno) for the harmonization of the physical body, based on a profound understanding of the entire human being; in some respects it can be likened to Tai Chi and other such methods, yet it is fundamentally different. Paneurhythmy is perhaps best described as a set of spiritual exercises for the modern, dynamically evolving Man, aiming to give health on all levels. The link is to an article on Wikipedia.org. Golden light of Love, for dead men, for shades, do you shine then? Radiant visions recalled, even this night, then, you pierce? Who so freely would grant looks that were blessings to me! Quiet roses, and you, lilies, I often invoke! Nor of Lovers, to whom different life is vouchsafed. The Bulgarian publishing house "Janua-98", which almost solely publishes the authentic, unedited lectures of the Master Peter Deunov (Beinsa Douno). They have so far published over 80 volumes of lectures. Dr. Vergilii Kreustev, who is the organizer and coordinator in Bulgaria for publishing the authentic, unedited Word of the Master Peter Deunov (Beinsa Douno) and compiler of the volumes "Izgrevat". Ognian Kulev's Bulgarian Library "Triangle" (previously Library "Beinsa Douno"). Christophorus would like to especially acknowledge this site, for it provides online, without any charge and for all people, the fullest Bulgarian resource for lectures of the Master Peter Deunov (Beinsa Douno), many from the authentic sources of the publishing house Janua-98 (those in boldface). The image at the top of the web page is a reproduction of the central panel of Rogier van der Weyden's (c.1400 - 1464) "The Last Judgement". The image right of the table of contents is a reproduction of a work (detail) by Hans Memling (c.1435 - 1496). 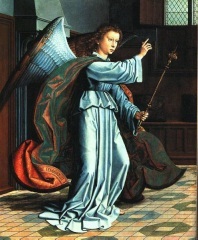 The image left of the table of contents is a reproduction from the left panel of Gerard David's (c.1460 - 1523) Annunciation from the "Cravela Alterpiece". The text on this web site is Copyright (c) Christophorus 2006-2015 and the translations are Copyright (c) their respective authors (all rights reserved) - all for the sake of them not being edited; No translation on this web site of the Word of the Master Peter Deunov (Beinsa Douno) is based upon copyrighted material.